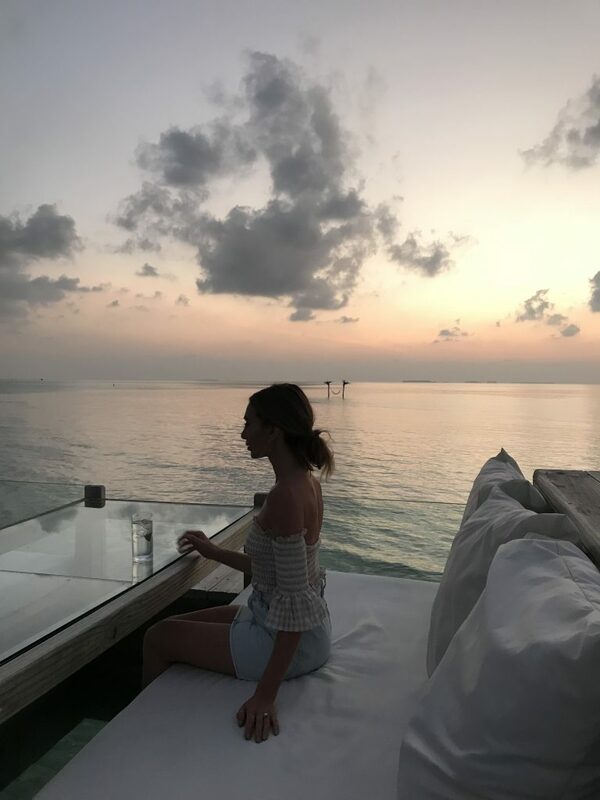 I have been lucky to travel to some of the most incredible resorts around the globe. This also includes visiting a 5-star resort in the Maldives a few years ago (Jim and I visited the Maldives on our honeymoon). 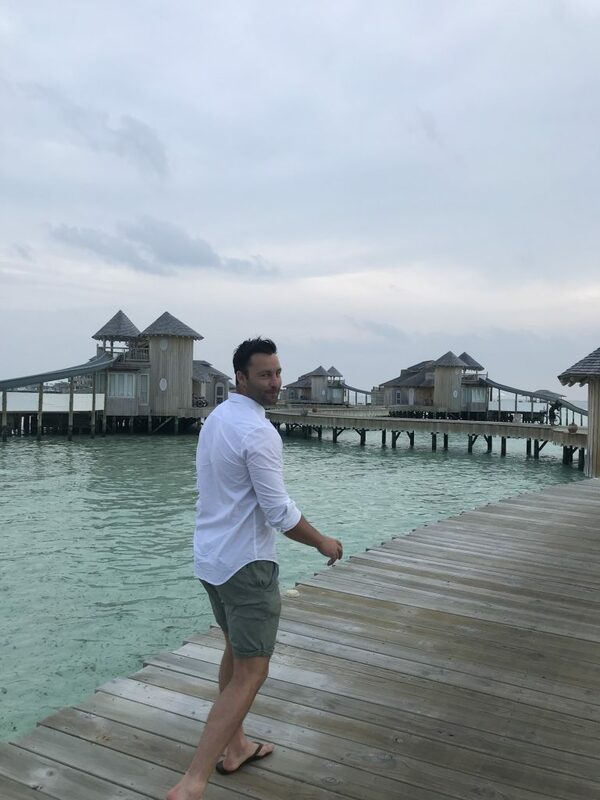 But I must say, arriving at Soneva Jani, nothing else compares to it, as it was easily the best resort I have ever visited in my life. 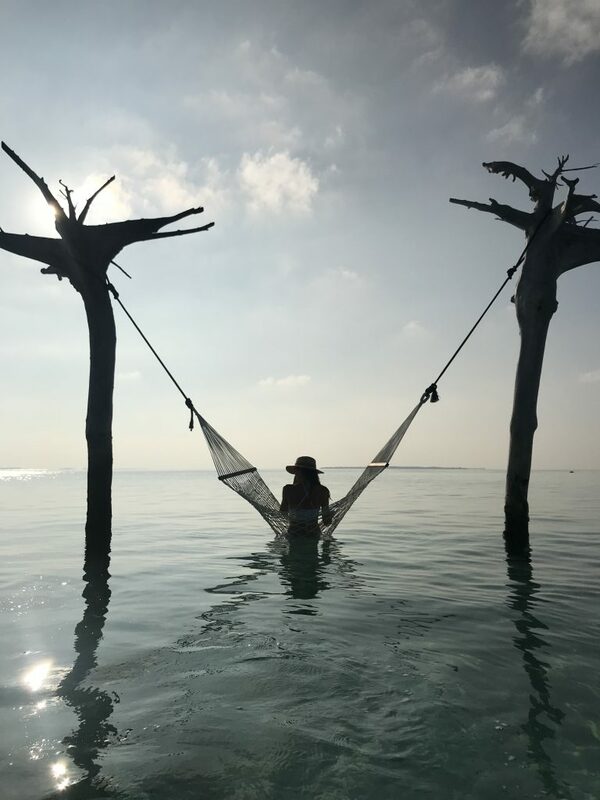 I had arrived at Soneva Jani after spending a few days at the incredible jungle haven that is Soneva Fushi which is located in the stunning Baa Atoll (it took us about 40 minutes on a seaplane to get there from Male Airport). 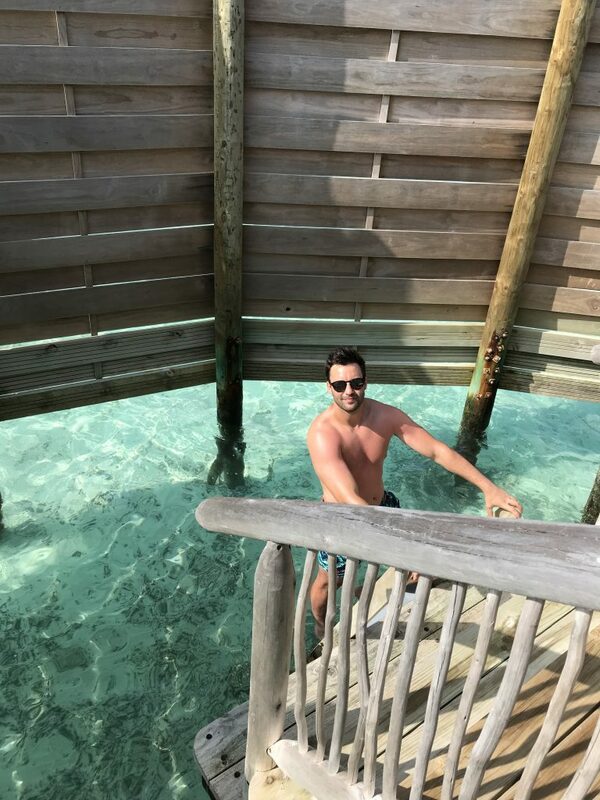 I was in awe of Soneva Fushi when I stepped foot off the boat. As soon as I arrived, I thought it would have been the perfect place to take Aston as there is so much space. 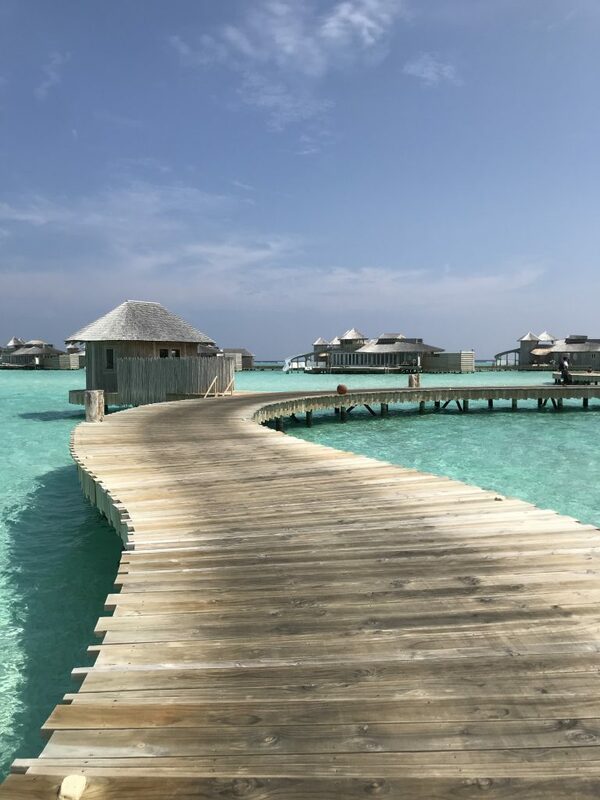 It is located on one of the largest islands in the Maldives, and I love that Soneva Fushi is different to what you initially expect from a typical Maldives resort (as all you see is overwater bungalows on Instagram). 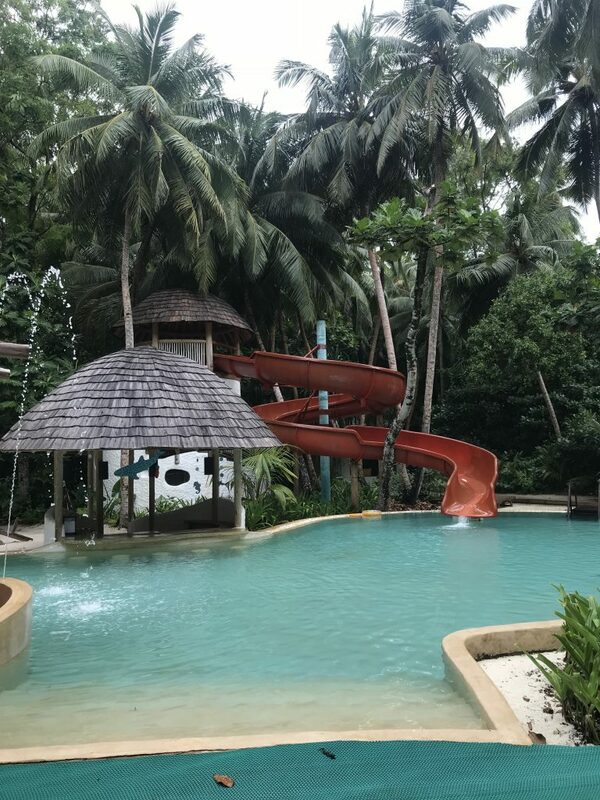 Instead, this resort is all about the beautiful rainforest and land, which makes it perfect for kids. I didn’t even realise this before booking. 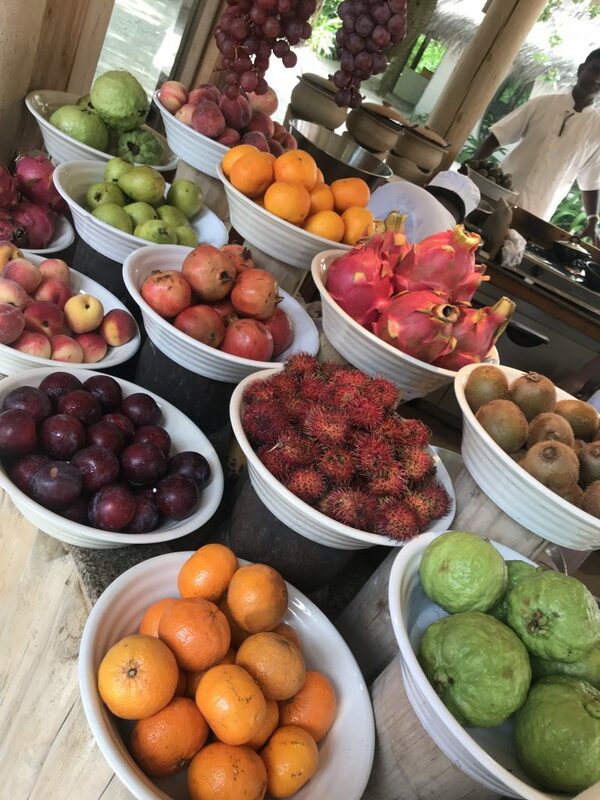 Soneva Fushi is sprawling with sandy paths, beautiful lush trees and foliage as well as cute rabbits and fruit bats flying around. We were greeted with our own bikes for the duration of the stay to get around. You feel so relaxed as you are truly on your own island getaway. The only time we saw other hotel residents was when we went to breakfast in the morning. The villas fit in perfectly with the environment, as they resemble tree houses (but large oversized versions). We could have comfortably fit our whole extended families in our villa. 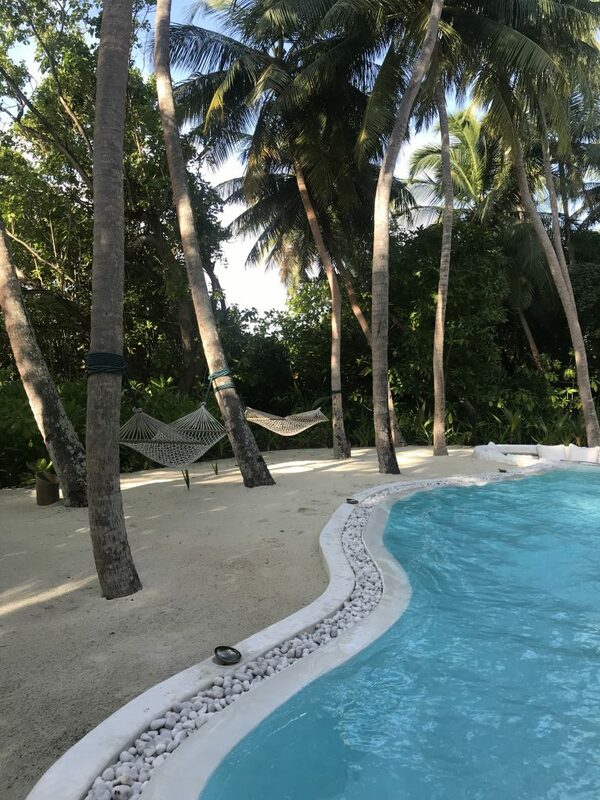 The villas are made with raw recycled timber, and feature our own huge private swimming pool, outdoor showers (Jim’s personal favourite- I think every guy loves an outdoor shower) hammocks, swinging chairs and water hammocks. Pure Luxury! Everything was thought of. Right in front of our personal pool was our private beach area. Our double story villa was also fitted with a luxurious outdoor bathroom that perfectly brought the outside in. Imagine having a shower or bath in a rainforest. It was so relaxing looking at the stars at night. Our private pool, hammocks and villa below. The outdoor couches in our villa were so relaxing and perfect for afternoon tea or red wine. The beautiful view at breakfast and the coffee was so good- this says a lot coming from a Melbourne coffee snob. 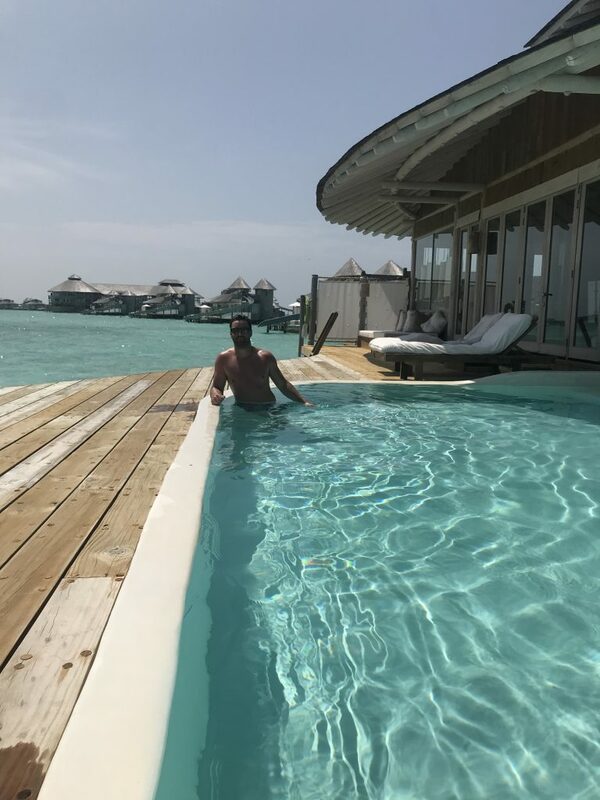 One of the other incredible features of Soneva Fushi, and why I think it is an amazing holiday for the whole family is the cool Chirldrens Den (more information here). It has a cool pirate ship, two swimming pools, lego room, cinema, music room and more. 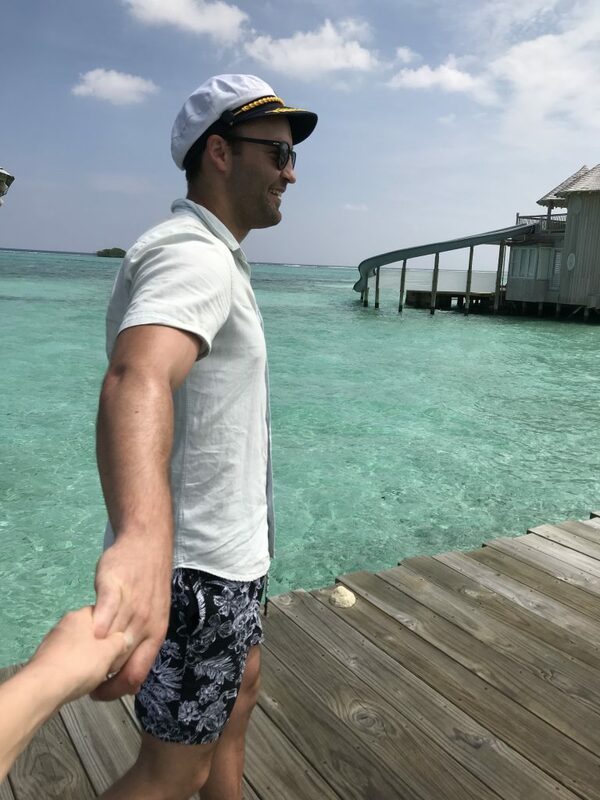 We didn’t think it could get any better than Soneva Fushi, but after a few days it was time to go to the next Soneva location, so we took a speedboat for about 60-minutes to Soneva Jani which is located in the Medhufaru lagoon in the Noonu Atoll. 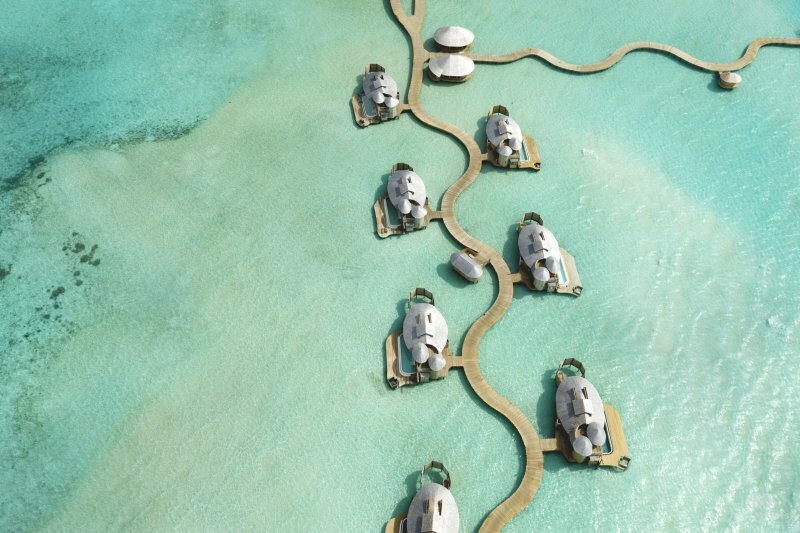 The resort can also be reached by a 40-minute seaplane direct from Malé Airport. 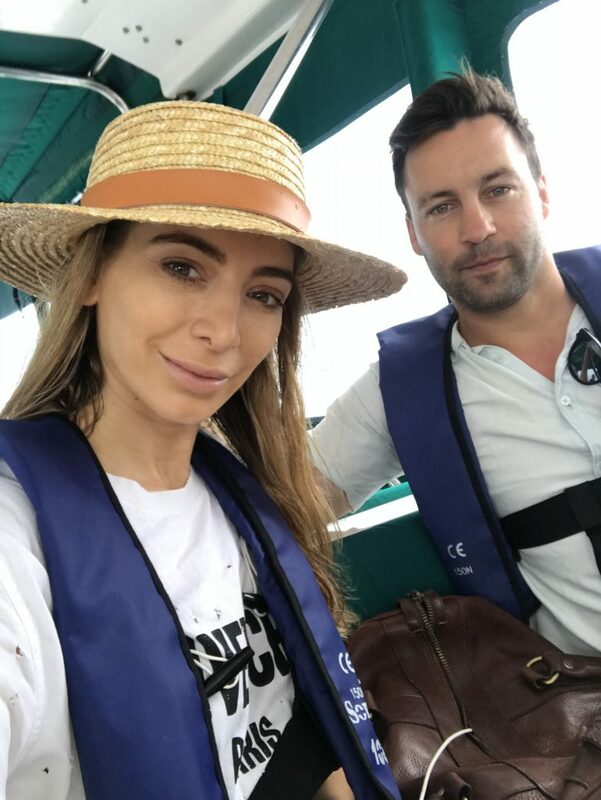 As our speedboat got closer to the resort, I crawled over to the front of the boat to get a better view, and I saw crystal clear water as far as my eyes could see and villa after villa floating above the water, each with huge waterslides twisting down into the ocean. Yes, waterslides into the beautiful water. Eeeep! Pure heaven!! At the dock, we were greeted by our ‘Mrs Friday’- this is a title they use in the Maldives, aka our personal tour guide and host. She took us to our incredible villa. 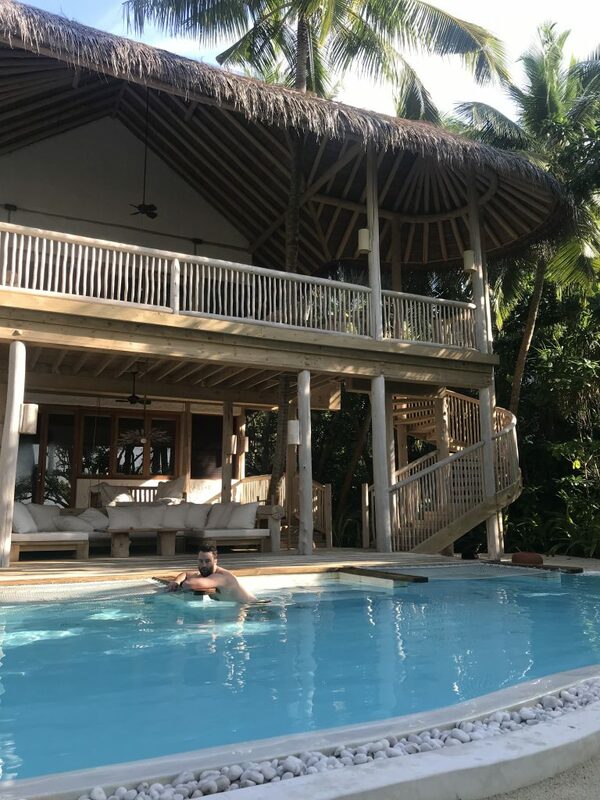 We stayed in two villas during our time at Soneva Jani; this is because we booked so late, so there wasn’t much availability. Walking into the villa it was honestly like nowhere I have stayed before. Talk about pure luxury! 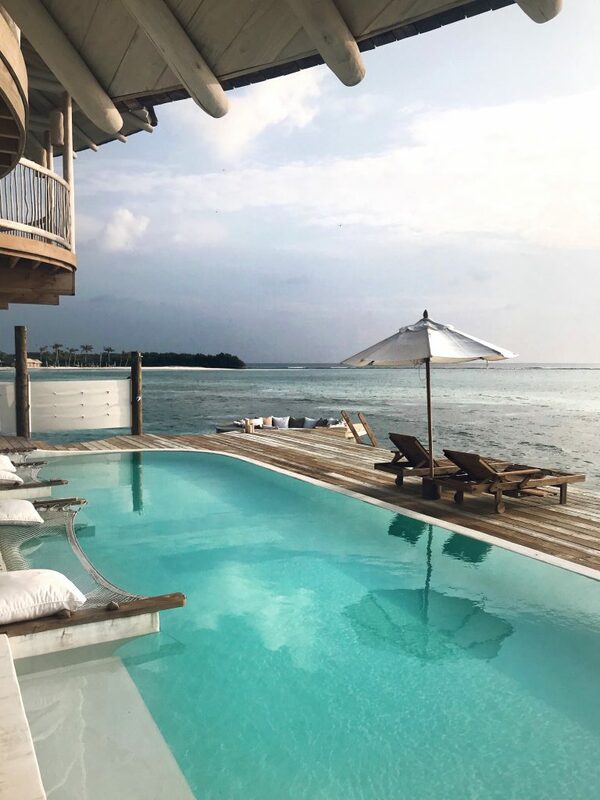 The villa had two bedrooms with an office that looked directly to the water, large pool and circular seating area that was perched on the deck and looked over the water. There were views from every angle of the villa and I was it felt like a dream. I know that sounds corny but both Jim and I were continually gasping. The view of the villas from above!!! WOW! Believe it or not, this is our bathroom, which had an incredible floor glass window that looked into the ocean and stairs into the water. This was our first night at the resort, on the way to dinner. The island is filled with white sandy roads and a floating cinema, which Jim and I loved. Right in the heart of the island is a big three-storey structure that connects the overwater villas. It is home to the restaurants, spa, library and wine cellar. I miss the food and view at this place so much. It also had so most comfiest hammocks located all the way around. We loved having afternoon drinks there in the evening. Now it was time to move to our next room, and wait for it; it had a slide. Yep, just a little old slide that winds down into the ocean. See me go down it here. This room was slightly smaller in size than our first villa, and by no means am I complaining, they were both incredible. Another one of my favourite things on the island is the hammock set up in the middle of the water. We headed here a few times when the tide was low; it was one special view. 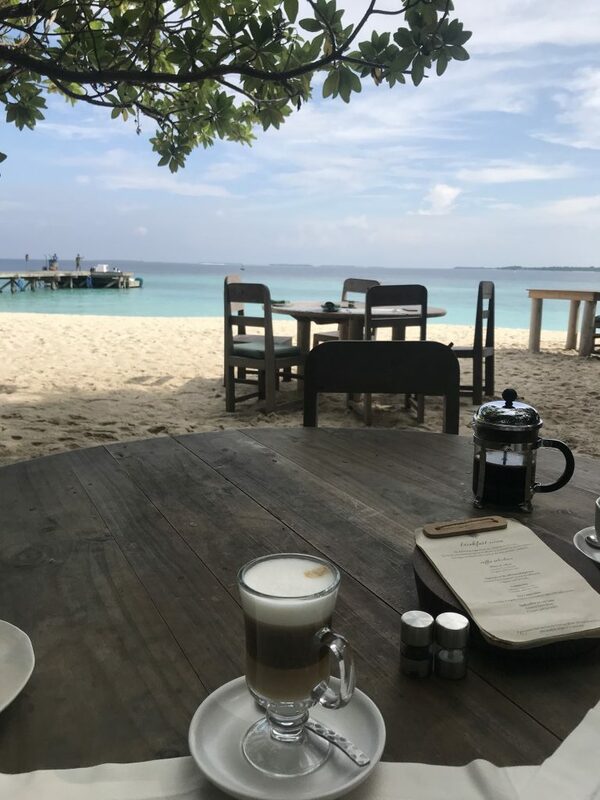 I cannot wait to get back to Soneva again in the future. I am planning to go with my whole extended family next time. 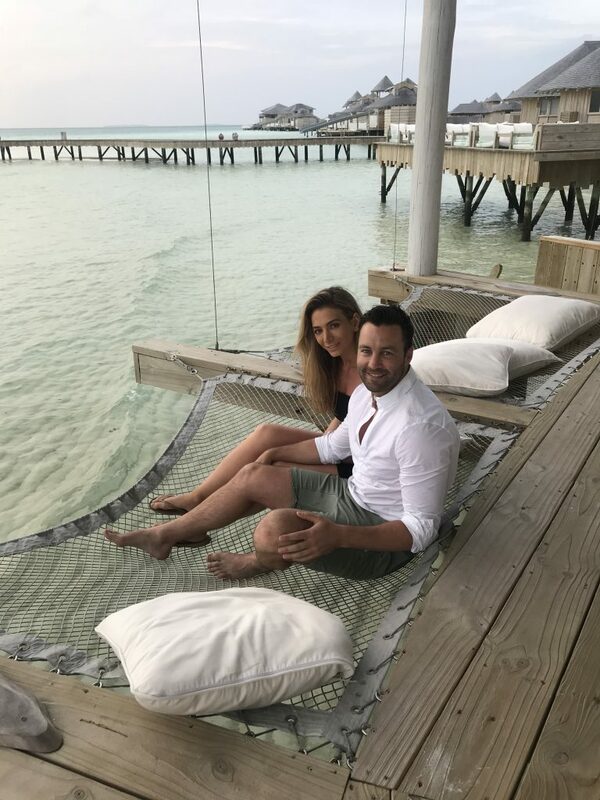 Both Soneva Fushi and Soneva Jani were incredible and blew my expectations out of the water.